The exponential growth in the world of fashion requires designers and brands to face new challenges, such as innovative materials, new processes and forms of distribution, etc. providing differential value and meeting the needs of future users. Technology offers innovative features that can add great value to the product and make a difference: materials that change colour depending on the temperature, garments with inbuilt wearables or made with technical fabrics that repel stains, etc. Throughout his professional career he has trained and practiced in several disciplines such as quality, sustainability, leadership and coaching. He has a degree in chemistry, and began his career as a teacher, before spending more than 22 years in various roles, such as director of quality and sustainability at companies from different sectors, such as Panrico and Joyco-Wrigleys (food sector), Loewe (luxury) and El Corte Ingles (retail). In all these experiences he combined the purely technical with management elements, coordinating product design and development, technical production aspects and the management of many partners. In 2013, the Spanish Quality Association awarded him the prize “Spanish Quality Leader”, and he was a finalist the following year in the European edition. 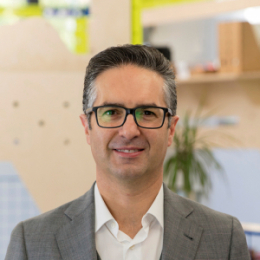 At present, he is the cofounder of Ingenieria del Crecimiento, which focuses on accompanying companies in their development, through the connection between people and processes.